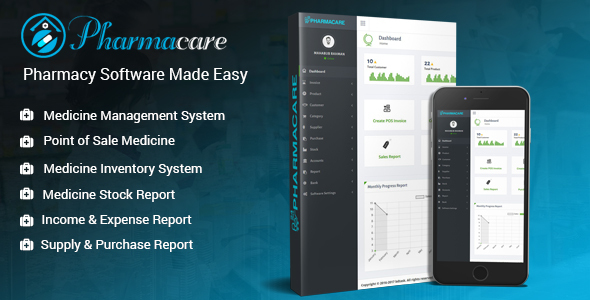 Pharmacare is a pharmacy software which is responsive Modern design for any kind of pharmacy.This pharmacy software is actually used for pharmacy data management. This pharmacy management system software is developed by PHP and Codeigniter framework. It is design and develop for pharmacy, medicine store, departmental store and medicine shop.Handle all of your pharmacy data easily.Here you can handle all of your pharmacy account management, invoice create, user and data analysis, stock management, store management, purchase history, income history, pos and many more.